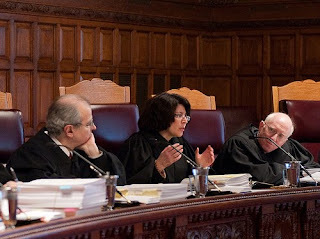 Well, that’s what they call a “hot bench.” In 50 minutes of argument, the seven justices of the state’s highest court, the Court of Appeals, peppered the attorneys on both sides of the Atlantic Yards eminent domain suit with tough questions yesterday, essentially derailing both lawyers' efforts to proceed through their arguments. In the end, there was no way to tell how the judges would rule in the only case that can formally stop the project, but, given the multiple legal issues in play, it's plausible they could focus on just one to resolve the case, known as Goldstein, et al. vs. New York State Urban Development Corporation d/b/a/ Empire State Development Corporation (or ESDC). Speaking afterward outside the Albany courthouse, plaintiffs' attorney Matthew Brinckerhoff pronounced himself "cautiously optimistic." 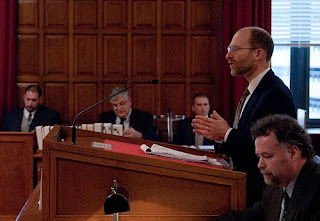 While representatives of developer Forest City Ratner and the defendant Empire State Development Corporation (ESDC) weren’t talking, they praised defense attorney Philip Karmel enthusiastically. And the ESDC issued a statement: “We expect that the Court of Appeals will recognize the many substantial public benefits of the Atlantic Yards project, and that the court will affirm the Appellate Division’s prior unanimous dismissal of this case." 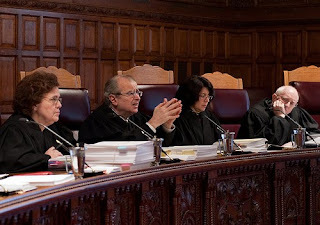 Eminent domain plaintiffs have a particularly uphill battle in New York State, with judges generally willing to defer to an agency's rational basis for condemnation--a very low bar for the ESDC. Only in a fraction of Brinckerhoff's argument did he get to make the fundamental case that Atlantic Yards is a sweetheart deal. 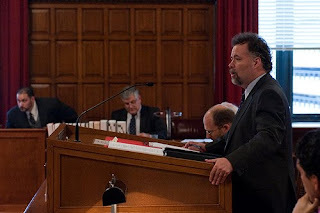 While Brinckerhoff was on shakiest ground in declaring that public use, in New York State, had to mean strict public use, ESDC attorney Karmel stumbled when faced with inconvenient facts, notably that, when the project was announced in 2003, there was no mention of blight removal as a justification. And, under pressure, Karmel essentially acknowledged that Atlantic Yards, above all, was a market-rate housing project. Smith, who questioned whether the state "had gerrymandered" the project site to suit Forest City Ratner, seems likely to write a forceful dissent, especially since Karmel essentially agreed that the state has carte blanche to take anyone's home for eminent domain. But it was unclear whether he would bring anyone with him. 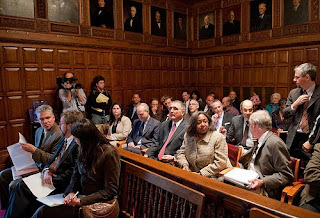 Several judges held their counsel, and positions may not emerge until court conferences and the writing of an opinion. 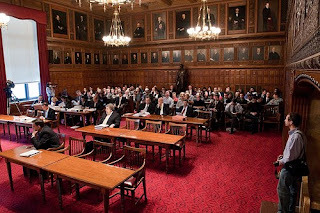 Albany Law School Associate Dean Patricia Salkin commented that the court "spent a lot of time on whether they even had jurisdiction in this case." Assuming they do get to the merits, she agreed the judges wouldn't reevaluate public use. "The only argument that truly animated the Court was the constitutional requirement to provide low income housing and whether that applied here," she observed. "This is a truly novel argument of many dimensions. This opened the door for the Court to ask specific questions about the public subsidies and exactly what they were underwriting in the project." True enough, though the court did not spend much time on Brinckerhoff's potentially powerful argument about the failure to compare public benefits. Two of the fastest and strongest initial articles came from reporters not present in the courtroom, who had the advantage of watching the webcast and typing notes, while those of us in the courtroom had to rely on pens. And, interestingly enough, Nicholas Confessore's CityRoom report in the New York Times (not in print, curiously enough) focused on skepticism two judges showed toward ESDC lawyer Karmel. Here's coverage from the Brooklyn Daily Eagle, Reuters, the AP, and the New York Daily News. It was the final round in an eminent domain case subject to two rulings at the first level of federal court, a dismissal at the appeals court, and an unsuccessful effort to get the Supreme Court to accept it. Then a separate state case was filed and heard, as with all state eminent domain cases, at the Appellate Division, which dismissed it unanimously. However, the Court of Appeals had never ruled on whether the state constitution offers greater protection than the federal one and, in a surprise, accepted the appeal. A decision is expected around Thanksgiving. Forest City Ratner has said it wants to break ground on the arena by December 1. That may be logistically possible, should the court rule in favor of ESDC, but it would not be a groundbreaking on a fully cleared site: those subject to eminent domain might not be gone for some 90 days. For supporters of the plaintiffs, organized and funded by Develop Don't Destroy Brooklyn (DDDB), the day began with a chartered bus that departed from a corner of the Atlantic Yards footprint, outside Freddy’s Bar & Backroom. City Council Member Letitia James, the project’s leading political opponent, was unable to travel to Albany, but saw the group off. 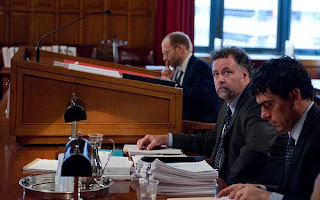 Goldstein (center in photo) predicted that the discussion in court would be about public use and blight; he did not forecast how much time the court would spend on procedural issues. State Senator Velmanette Montgomery (left in photo) scoffed that the project site was blighted "This is a matter of principle," said plaintiff David Sheets (right in photo), a Dean Street resident, who indicating that, unlike property owners who are supposed to get just compensation, "I am a renter. I'm not a homeowner… What is happening is unethical. it's been deceitful." Perhaps in counter-programming, a dueling press conference was scheduled, not by the state or (directly) the developer but the Atlantic Yards Community Benefits Coalition. However, by the time they arrived—a bit later—the press and spectators were waiting on line to get out of the chill and into the courthouse. Among those present were CBA signatories James Caldwell (right) and Marie Louis of BUILD (Brooklyn United for Innovative Local Development); Delia Hunley-Adossa of Brooklyn Endeavor Experience; the Rev. Lydia Sloley of Faith in Action; Len Britton of the New York State Association of Minority Contractors. Brinckerhoff, given 25 minutes to argue the case, reserved five minutes for rebuttal, which was a wise move, given that, in the initial 20 minutes, he didn’t have the chance to fully air his case. He began by asserting that the ESDC's use of eminent domain should be rejected for three independent reasons. First, he noted that it violates New York's public clause because the takings are justified as economic development, an argument that drew a nearly immediate intervention from Chief Judge Lippman. "Doesn’t public use have pretty broad standard today," asked Lippman, indicating that, as with cases decided under the federal constitution, it also means public purpose, broadly defined. "I think it certainly has expanded over the last 50 years," allowed Brinckerhoff, acknowledging U.S. Supreme Court doctrine. 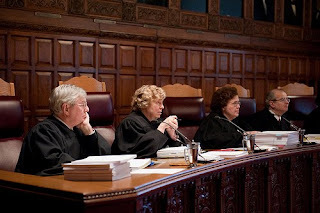 What about under New York’s Eminent Domain Procedure Law (EDPL), asked Judge Susan Read. The EDPL doesn’t control the state constitution's public use clause, responded Brinckerhoff. What, she asked, does constitute public use. Anything owned by the government or open to the public, he responded. Judge Eugene Pigott asked about a publicly owned arena, such as the stadium for the Buffalo Bills. That's not public use, Brinckerhoff responded. Even though the county owns it? Brinckerhoff said he hadn't known who owned it. The important distinction, he said, is if the Brooklyn arena were truly owned by the government for a civic purpose, like a museum or a cultural institution, the argument would be stronger. What do you mean, Lippman asked. Brinckerhoff pointed to a series of dollar-a-year leases for the arena, needed to comply with the Urban Development Corporation Act. (He didn't mention that the fig leaf of public ownership is needed to issue tax-exempt bonds and save Forest City Ratner some $200 million, according to the New York City Independent Budget Office), a benefit provided by the ESDC. Won’t the arena provide recreation facilities for Brooklyn residents, and for schoolchildren, asked Judge Carmen Beauchamp Ciparick. Brinckerhoff, missing the chance to say that such rentals might cost $100,000 (according to the 2006 KPMG study commissioned by the ESDC, though the state claims that isn't true), pointed out that, “I don’t think anyone could argue that its primary purpose is to provide facilities for community groups. The primary purpose is to house a for-profit professional basketball organization." 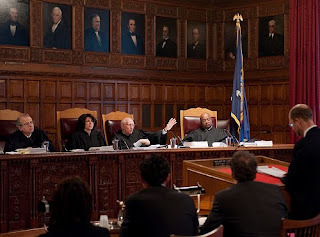 Judge Victoria Graffeo suggested that the state had long ago expanded public use beyond public ownership, bringing up the elephant in the room: a 1975 case known as Yonkers Community Development Agency v. Morris that was given short shrift in the appellants' briefs. Brinckerhoff dodged the issue somewhat, saying the question was whether the state court would follow the Supreme Court's controversial 5-4 2005 opinion in Kelo v. New London, allowing eminent domain for economic development. "What about our cases?" Graffeo asked. Lippman stepped in: Wasn’t Kelo specifically rejected in Goldstein vs. Pataki, the eminent domain case brought in federal court? Brinckerhoff assented, but said the state court had not had the opportunity to "go as far" as the majority did in Kelo. "They didn't have the kind of study that was occasioned in this case," Graffeo (center) suggested, apparently citing the long administrative record that the ESDC had developed, a record aimed in part at showing courts that the agency had acted rationally. "There wasn't that kind of record developed in Kelo, was there?" "We're not saying the justification was blight," Brinckerhoff responded, apparently concluding that Graffeo's mention of "the record" was the ESDC's Blight Study. "Although if you look at the blight justification, it's the other side of the economic development coin. What they're saying is that there's a below-grade open railyard that is unsightly, that there are properties that are underutilized, that's the fundamental basis for the blight determination… and at the end of the blight study, it's all about whether we should revitalize this particular area, which is another way of saying, should we take these properties for economic development purposes, which was the central question in Kelo…. And if this court were to rule that economic development was not a sufficient basis for taking someone's home or property, at minimum, it would require a remand to the ESDC to make a determination whether or not there's a public use…"
“I’m trying to understand the rule you're asking us to adopt," said Graffeo. First, said Brinckerhoff, the court should rule unequivocally, consistent with the four dissenting justices in Kelo, that economic development is too elastic and too able to be manipulated to be used for eminent domain. Judge Robert Smith, perhaps the most conservative member of the court, asked if there was a legal distinction between blight removal and economic development. “If you’re talking about what I would call true blight, yes," Brinckerhoff responded, citing the constitutional changes in the 1930s. “Old-fashioned slums,” Smith said helpfully. Smith said it was OK for the state to take a slum and essentially sell it to a private party to remove blight. Brinckerhoff assented. Part of the site not blighted? Smith asked if Brinckerhoff thought the three blocks--actually, two and one quarter--between Dean and Pacific streets in the project footprint—which are outside the Atlantic Terminal Urban Renewal Area (ATURA) blocks were blighted. "Actually, we're saying no part was blighted, not as that term was understood,” Brinckerhoff responded. "So you are saying we should go back to that," Lippman said. "What role does the legislature play in all this, determining public use?" Judge Theodore Jones asked if there’s a distinction between Atlantic Yards—he used the term as a synonym for the railyard, not the project as a whole—and the property below Pacific Street occupied by Brinckerhoff’s nine clients. Brinckerhoff said yes, noting that the area north of Pacific Street was designated as an urban renewal area, the Atlantic Terminal Urban Renewal Area (ATURA), many years ago. But the reason for that designation, he said, is really no different than economic development as a justification for public use. "The basis for that justification is that there's an unsightly, esthetically displeasing railyard, and properties that are not fully utilized." Smith asked if there was anything in the record that said the properties below Pacific Street were blighted. Smith said that the study said that the project site as a whole is blighted, but his reading was that the northern part was blighted and the southern part was added on. "From your point of view, it's a friendly question: do you see it the same way?" Brinckerhoff said yes, but said that in the Blight Study as a whole, "they're primarily talking about underutilization, certainly in the southern half in particular. And they're saying that any time your home or your business is not built out to the maximum degree allowable, it's subject to being declared blighted… and can be taken and given to a preferred private developer so they can generate more tax revenue." Then, before Brinckerhoff could get to perhaps his strongest argument—the failure of the state to measure a relative benefit between the public and the developer—Pigott dialed back to a threshold procedural issue, but one that the Appellate Division had already decided in the plaintiffs' favor. "Isn't there a timing problem here?" he asked. Didn’t the plaintiffs have to commence the case within 30 days of the eminent domain determinations and findings rather than wait six months after the federal case was dismissed. “Isn’t it a little weird,” asked Smith, to have a six-month grace period on a 30-day statute of limitations. Brinckerhoff said he couldn't disagree, but said other cases gave the OK.
Read, essentially referencing an argument from the ESDC, pointed out that the whole point of the EDPL was to get cases moved expeditiously. Pigott agreed: "It’s not a statute of limitations. It’s a condition precedent to judicial review." Read (speaking in photo) seemed skeptical. “Doesn’t your analysis, though, provide a Mack Truck to barrel through the conditions the legislature put in the EDPL?” she asked. No more, he said, than Article 78 of the CPLR (New York Civil Practice Laws and Rules), he said. “You’re saying it’s a mistake we already made,” Smith said helpfully. "When there's a federal court component, there's no question you can bring an Article 78 claim as a supplemental claim,"
Brinckerhoff agreed. And then his 20 minutes were up. 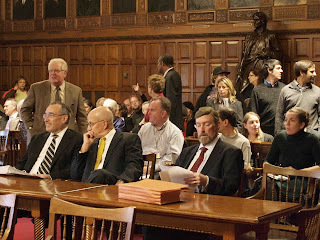 While Brinckerhoff (foreground in photo) presented a cordial, informal style before the bench, Karmel (standing in photo) was more aggressive, sometimes not immediately yielding when judges intervened. Karmel piled on to the threshold timing issue, saying the case shouldn’t have to be heard on the merits because it was filed too late, and that the 30-day deadline trumped the six-month one. “Isn’t six months a grace period, not a deadline?” asked Smith. "It is a grace period," Karmel said, "but if applied here it would establish two deadlines." “I see the strangeness of having a six-month grace period on a 30-day deadline,” Smith acknowledged, pointing out how the court had allowed a four-month grace period in another case. Karmel said, that when laws conflicted, the EDPL should be the controlling statute. Smith said grace periods are always inconsistent with deadlines. Pigott asked, as a practical matter: should plaintiffs file two lawsuits at the same time, in state court and federal court? Yes, said Karmel. "They can't come back later in violation of the deadline set in the EDPL." Then, about seven minutes into Karmel’s 25-minute argument, Lippman intervened, suggesting that the lawyer address the merits of the case. Interestingly enough, Karmel brought up the issue of pretext—an argument in the plaintiffs’ briefs but one Brinckerhoff had not yet made during his stint at the lectern. The appellants concede that more than half the site was blighted, Karmel said, citing ATURA, a long-standing urban renewal designation from 1968. "In addition to ATURA," Karmel responded, reverting to the bureaucratic language needed to convince courts that agency decisions are rational, "the record also establishes that the project site is blighted." "Does anything say the three southern blocks are blighted?" asked Smith. "That is correct, your honor," Karmel responded. Why, Smith asked, "didn’t it say 'blighted properties'?" “I think that the Blight Study provides objective information about each lot,” Karmel declared, in a line that had some in the audience—OK, me—stifling a spit take. Smith (speaking at left) was skeptical. He pointed to photographs in the Blight Study of Pacific Street. “No, your honor," Karmel responded. "The Blight Study establishes that the project site is blighted and ESDC had a rational basis for its determination of substandard and--” Smith interjected, asking hypothetically if it was OK for a developer to ask the government to condemn a whole site even if half of it isn't blighted. He continued by contrasting this case with one called Denihan Enterprises, in which two-thirds of a city block was to be condemned for 17 public parking spaces. "So the court said there seemed to be an inadequate nexus between the stated public purpose and what the project would in fact achieve," he said. "That's the kind of case where pretext is something that needs to be analyzed--" Smith interrupted, pointing to a charge in the petitioners’ brief that the state did not raise the issue of blight until some two years after the project was announced in December 2003. "That's not correct, your honor," Karmel said. He paused, slightly derailed, and began talking about the Blight Study. "Wasn't this originally seen as a community development project" Smith (left) asked, but blight was later needed as a justification for condemnation. "Absolutely not," insisted Karmel. "There is nothing whatsoever in the record." Smith acknowledged there was no direct evidence, but asked, "At the time this was announced, when people were holding press conferences, where does the word 'blight' appear?" Karmel soldiered on, despite having no evidence from 2003. One of the two Memoranda of Understanding signed in 2005, he said, refers to the Atlantic Terminal Urban Renewal Area. Karmel paused, trying to steer the argument, and said, "I would like to go back to this issue of pretext." No loan, or subsidy shall be made by the state to aid any project unless such project is in conformity with a plan or undertaking for the clearance, replanning and reconstruction or rehabilitation of a substandard and unsanitary area or areas and for recreational and other facilities incidental or appurtenant thereto. The legislature may provide additional conditions to the making of such loans or subsidies consistent with the purposes of this article. The occupancy of any such project shall be restricted to persons of low income as defined by law and preference shall be given to persons who live or shall have lived in such area or areas. "Can those subsidies be used in a housing project that is not low-income housing?" he asked. "The answer to that is yes, your honor," Karmel responded. "But that question does not even need to be reached by this court. And the reason for that is appellants' entire case is predicated on a factual error. In this case, the record is crystal clear that the $100 million appropriation by the state legislature is for infrastructure for an arena." Aren’t more subsidies going into the project, Lippman asked. Karmel allowed there was city money. That’s not subject to Article 18, Lippman asked. “But again, the majority of this project is housing, isn't it? And the majority of the housing--a great majority--is market-rate," Lippman stated. “So indulge me. Let's assume that we’re talking about clearing blight, building housing that's not low-income housing for the most part. Can you get state subsidies despite that… in light of the purpose of Article 18… this whole idea was, when you have a project like this, it's to clear the slums." Karmel said that Article 18 has two distinct and separate purposes: one, the clearance of substandard and insanitary areas; the other, the construction of low-rent housing. "This court," he said, "said those were separate and distinct." Lippman asked if the power of condemnation in this case came from Article 18. No, said Karmel, noting that the state had the authority before Article 18 was enacted in the 1930s. In a case called Muller, he noted, the court held that "two tenement buildings could be cleared because they were a substandard and insanitary area and the public purpose was the elimination of the blighting conditions." Karmel went back to the two purposes in Article 18, Section 6. Lippman held firm. “A small part of the project is low-income housing, right?” the Chief Judge asked. "You're providing for a large amount of market-rate housing, right? Lippman asked. "That's a main purpose of this project-the majority of this project is market rate housing," Lippman continued. Lippman pressed on, asking if market-rate housing was "the largest component of the project"? Lippman asked a bit quizzically. He went back to the two purposes. Smith asked Karmel, that if Article 18 had never been enacted, the state would still have the power of condemnation. So the whole discussion of Article 18 is needless, Smith said. "That is correct," Karmel said. "If you’re getting public subsidies to build private housing," Lippman asked, "does that violate Article 18?" Karmel said no. "Section 6 relates only to low-rent housing. So if it doesn't involve low-rent housing, it has nothing to do with Section 6." "So if it's not low-rent housing, then it doesn't apply," Lippman summed up. “That’s kind of a simplistic view,” continued Lippman. Are public subsidies going to market rate-housing, Lippman asked. No, said Karmel, who repeated that state money would go to the arena and the railyard. How much additional state and city money is going into the project, Lippman asked. "Doesn’t the developer get certain credits for developing affordable housing along with the market-rate housing?" asked Ciparick. "That enables him to construct more housing," Ciparick said. “Money is fungible,” Smith intervened. "If he weren't getting the subsidy for the stadium, he wouldn't be able to do this whole project." Karmel responded with a verbal shrug: "What the consequences to the project would be if the state did not supply the hundred million dollar subsidy is not set forth in the record." "But it probably would not be good," Smith countered. "The developer would have a hundred million dollars less," Karmel said. The state money, he stressed, would go to a state-owned arena and a railyard owned by the MTA. Brinckerhoff, Lippman suggested, said the arena's not really owned by the state. Karmel said it was being leased to a local development corporation (LDC), which would lease it to a Forest City entity—his tone suggesting there was perhaps an arm’s length relationship, even though the LDC is a special-purpose subsidiary of the ESDC. Wouldn't the leases be for a nominal rent, asked Smith. “That’s not true, Your Honor” Karmel responded, managing a tone of sincere resistance, asserting that “among the leaseholder’s obligations” are to pay off “many, many hundreds of millions” in construction bonds. Left unsaid was those would be PILOTs (payments in lieu of taxes) set up to get the developer a lower interest rate and save perhaps $200 million, according to the New York City Independent Budget Office (IBO). Smith switched gears, asked if the ESDC wanted the court to uphold eminent domain for economic development, as in Kelo, or whether blight had to be found to justify the use of eminent domain. “The result is the same whether you follow Kelo or don’t follow Kelo,” Karmel said. "The project was approved as a land use improvement project and a civic project under the Urban Development Corporation Act. The ESDC found the project site was substandard and insanitary. That finding was both rational and supported by the--"
Smith interjected and, without referencing Justice Sandra Day O’Connor’s fiery dissent in Kelo, essentially brought up her point: "Is it the law in New York that if I own a house in an area that the government thinks could be improved, a perfectly nice house and it's a clean house and there's nothing particularly wrong with the area but it could better, it could be more vibrant, it could be more dynamic--is that enough for the government to take the house? 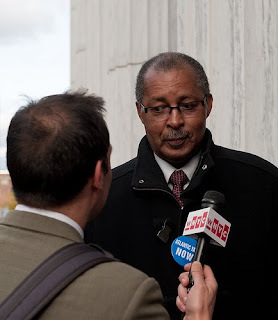 "Under New York State constitutional law, yes,” said Karmel, essentially saying that condemnors have carte blanche, given the wide latitude of eminent domain law. He cited a case known as Courtesy Sandwich Shop, which allowed the condemnation of 13 blocks for the construction of the World Trade Center. But this is not the doctrine that the ESDC is relying on in this case, he said. Rather, they're relying on the finding of the agency that's supported by the record, that the project site is substandard and insanitary. And, he said in closing, “it’s extremely well-established” that that's an adequate constitutional basis. In his final five minutes, Brinckerhoff finally got to the issue of relative benefits, saying that the ESDC conceded it made no attempt to compare the amount of private benefit to the developer and public benefits. He asserted that, under the court's precedents, it's been made “crystal clear” that there must be some comparison of the benefits. Lippman asked whether Brinckerhoff's justification for his argument was that most of the project would be market-rate housing. Read asked if there was a way to quantify those relative benefits. “It doesn't have to be mathematically quantified," Brinckerhoff responded, "But the analysis must be done." "They need to do something with percentages?" she asked. "They had to at least say what they thought the private benefit was," Brinckerhoff responded. "And here we have some sense of it." He cited the IBO report "released in June" (actually September, though a preliminary version was released in may), which indicated the arena would be a loss for New York City. The ESDC and the city of New York, which filed a friend-of-the-court brief, said such “non-record evidence” like the IBO report and information about how the project has changed should be disallowed. "Correct," Brinckerhoff said. "That weighing has to be done." Brinckerhoff returned to Article 18, Section 6. "The analysis is very simple. Section 6 is unquestionably a low-income housing restriction. The question is: when does it apply? The respondent says it only applies when you call your project a low-income housing project and it consists solely of persons of low income. Which basically writes Section 6 completely out of the Constitution." 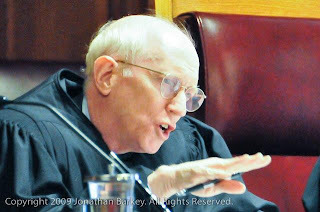 Lippman noted that the Appellate Division had ruled against Brinckerhoff’s argument. "It says pursuant to Article 18," Lippman said. Article 18 was passed because there was a constraint on providing public subsidies to a private entity fulfilling a public purpose, Brinckerhoff said. "That was prohibited by the Gift Clause. Article 18 made an exception in this case." "My point is, because this property is being condemned, it would violate Article 18, which expressly says the ESDC can condemn for slum clearance," Brinckerhoff said. This is not exclusively a housing project, one judge said. As soon as you do slum clearance and housing, Brinckerhoff asserted, the requirement is triggered. "That's why you're allowed to get around the Gift Clause, for this particular purpose," Lippman said. “Absolutely,” Brinckerhoff responded. "And that's what's violated, because, no matter how you look at this, it's a slum-clearance project--at least it purports to be--it has housing, and the low-income occupancy restriction must apply." And that was it. It was the first case of the day, and the majority of spectators left the courtroom and proceeded to the hallway and outside. 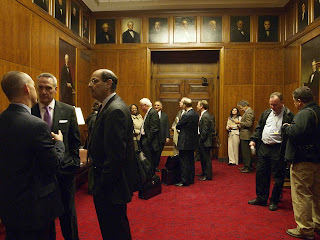 (In photo above, by Jonathan Barkey, FCR lawyers are in foreground left and ESDC lawyers in background left.) Brinckerhoff held an impromptu press conference, as reporters pressed him with questions rather than interview the CBA signatories. In that press conference, Brinckerhoff was asked (by Matthew Schuerman of WNYC radio) if he was trying to trip up the ESDC on a technicality regarding Article 18, Section 6. Brinckerhoff said no, that if anyone was relying on a technicality, it was the ESDC in trying to get the case tossed out without a look at the merits. He was asked on what grounds he was hoping to win. He said he couldn't predict a result. "Anything can happen" as the judges discuss the case, "and during the writing. For all those reasons, it's always a very dicey business to predict a result." Was it risky to ask the judges to rule on so many issues? "What we want them to rule is they're rejecting the [ESDC's] determination and findings--there are three different ways… they're all substantive legitimate bases." The DDDB group got back on their bus. Forest City Ratner representatives (such as Brigitte LaBonte, center, and General Counsel Berliner, right), dispersed. Some reporters went across the street to the Capitol pressroom to file their stories. Others, including this reporter and some lawyers, took the train. 2.) ESDC wants only as small a picture to be seen as possible. 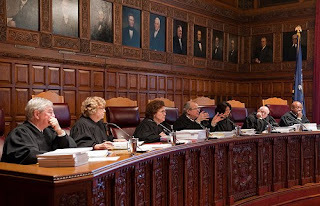 Therefore, not surprisingly, its case is being supported by the friend of the court brief that says the IBO report calculating that the Nets arena will be a $220 million net loss for the public should not be ignored, even though that report is the only government documentation of cost vs. benefit for the project that exists. 3.) ESDC brought up the question of its pretextual actions as the first question on the merits it wanted to address in its oral argument. 4.) 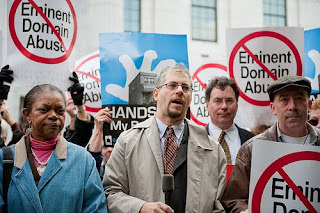 ESDC is fighting to be legally able to condemn without considering of the benefits delivered to Forest City Ratner vs. harm and absence of benefit befalling the public, without the “comparison of public and private benefits” that it didn’t perform. 5.) ESDC placed such a high priority in its argument (its very first priority beginning even BEFORE defending its pretextual conduct) on convincing the court NOT to consider the case based on the merits. Some of the Judges indicated via the questioning that they didn’t know where the restriction was or should be on taking property for “public use” if economic development was the stated (pretextual) goal. 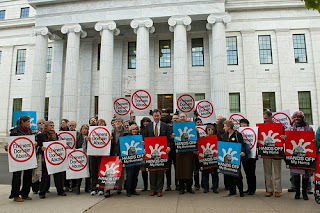 If this is the lack of restriction that would be possible in New York State when a developer initiates and without restriction draws lines around property on which he wants to gain a monopoly via eminent domain, then NY protections against abuse will surely be far more lax than even envisioned by the Kelo court opinion.